Interfaces formed or exposed by polymer mixtures are often employed in modern technological applications. This is especially true for thin polymer films used nowadays in photoresist lithography, electrooptical devices or nanometer-scale surface patterning. Apart from these technology-oriented aspects the interfacial phenomena in thin polymer films pose a fundamental scientific challenge to physics of polymers and thermodynamics of condensed matter. 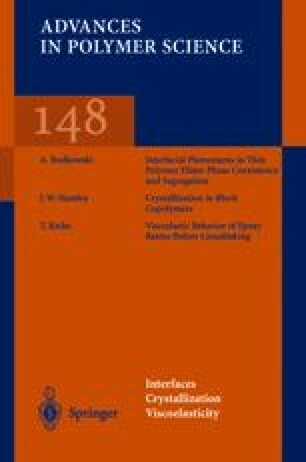 This work reviews experimental results on the equilibrium properties of interfaces created by polymer mixtures confined in thin films. It confronts experimental data with theoretical expectations based mainly on mean field models. Most of the data have been obtained by high resolution profiling techniques emerged in the last decade. These techniques allow us to trace concentration vs depth profiles across a thin film with a depth resolution better than the characteristic size of a polymer coil. The interfacial phenomena of phase coexistence and segregation are described as observed in thin polymer films. This work also considers related issues in the focus of current research such as wetting phenomena, finite size effects expected in very thin films, surface (and bulk) properties of mixtures with stiffness disparity and conformational properties of end-segregated macromolecules forming polymer brushes.